Back in February I made a Podcast* about the day Nancy came to Town. That day we enjoyed lunch at the Crown Bar in Belfast. 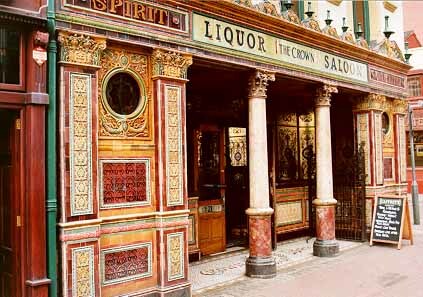 This popular bar is the only National Trust-owned pub in Northern Ireland and has been described as the best preserved Victorian pub in the UK. My podcast inspired Grandad to write about his memories of Belfast. I see in the Belfast Telegraph Newspaper this evening that the work on restoration of the building is almost complete. The ceiling hidden for years by a thick nicotine layer has been scraped and the restorers are discovering the beautiful colours beneath. 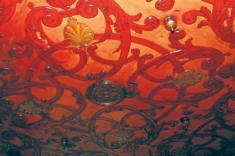 Project manager Claire McGill said booths, ceiling and tiles have all been given a new lease of life. More than 100 mirrored glass pieces from the snugs have been restored and will be reinstalled this month. Nancy, come October it might be time for another visit to Belfast. Now I wonder if these restorers working at the Crown Bar, had a little go at Grandad’s lungs what wonderful colours would they uncover? * The old Podcast has expired and it is my intention to retell the story and post it at a future date. This entry was posted in Travel on September 7, 2007 by Grannymar. What a wonderful place The Crown is! It deserves to be restored to its former glory.I thought it was beautiful as it was when I was there, but I can only imagine how it will look when it has been all polished up. Yes, I would love to visit again and sit in a snug and listen to the stories and laugh and cry at the same time. I look forward to your visit Nancy! My lungs are as pure as the driven snow [and if you’ve ever driven snow, you’ll know how pure that is!]. I’m not only a pipe smoker, but I smoke a pipe that looks like an oil refinery inside, with all its damned filters. I never saw a hen with a cigarette! Great looking pub GM even if it is a little ‘gaudy’. Nice to see this old places restored rather than demolished and concrete boxes being put in their place. Oh no! I was in Belfast on Tuesday and again today (Friday), although only passing through today. I will be back up there the week after next so I think I will certainly head there for a look. Baino, though it may be a little ‘gaudy’ it is unusual. It is lit by Gaslight. It has a good atmosphere and is very popular with locals and tourists. Robert, In the interest of good north, south relations I have checked this morning and The Crown is open for business. Lunches are can be had in the Old Dining Room on the first floor. They are hoping to have the workmen out and to serve lunches once more in the snugs from the end of next week. Also worth a visit is THE MORNING STAR, 17-19 Pottinger’s Entry (It runs from High Street to Ann Street) Belfast. 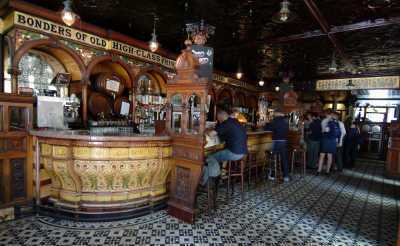 This historically listed pub has a menu which features traditional Irish as well as the more unusual such as crocodile. Originally a coaching house, this pub boasts winner of the British Airways Best Pub Food Award as well as being the runner-up in All Ireland Seafood Pub of the year and a Member of the Taste of Ulster. I’ve made a note of both of them and I’m going to try to get to them soon.